I feel sorry for any woman who has that for a name...likely, it won't be one to speak without thinking about the tragedy that is unfolding daily on the Gulf Coast. Frustrations about the delay of getting into our townhome seem foolish compared to people who have lost their homes, businesses, and cities. While I've watched the drama daily for material to be posted to WUSATV9.com...I've been angered at the accusations to the President and the lack of attention to Mississippi. New Orleans is a city...and all of it isn't underwater. Half of MS was damaged...the coast was nearly wiped clean...towns are gone. 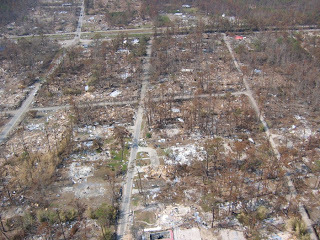 Waveland, MS - Total devastation following Hurricane Katrina. Yet, the media has ignored the fact of the city, county/regional, and state governments bare the load and are the first to respond to a natural disaster - not the Federal. Funny how this hurricane is different. It's different because it covers LA to FL in damage...which means everyone needs to chip in...hold the finger-pointing to improving systems in the future. Stop making a hurricane a political and racial issue. And somebody please pimp-slap the "Rev." Jesse Jackson. Idiot. My family fared well in the storm...and our friends seem to be fine. They've had to deal with gas shortages...power outages...loss of work...things that everyone else in Central and South Mississippi have been doing. I'm concerned for my aunts and uncles in Magee, MS. I heard severe damage was there and no word from anyone.